Shiny opaque medium cobalt blue handmade lampwork glass beads with a glossy bead finish. These beautiful rich deep lapis blue beads hand made using opaque lapis cobalt glass. These are a really rich deep blue and so gorgeous. They look wonderful as earrings, bracelets, necklaces and other accessories. 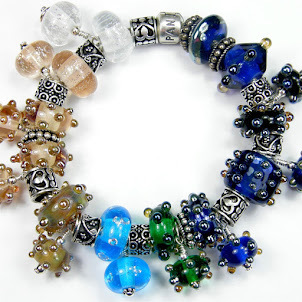 These gorgeous jewelry beads have a shiny glass bead finish. All glass lampworked beads are handmade by me, Covergirlbeads glass artisan, Charlotte Hayes. I am a Texas artist living in Alvin near the Gulf of Mexico. I am located near larger and popular Texas cities like Houston, Galveston and Sugar Land. I love incorporating my lampwork beads into jewelry designs using semi precious gemstones, pearls, crystals and other mixed media materials to create beautiful jewelry for you.